More wind turbines, fewer fish, floating islands of trash, and millions of gallons of crude oil in the Gulf of Mexico. With all these developments and many more manifesting in marine waters all over the planet, some observers are calling for Congress to do more to help generate and encourage more research on the health of the world’s oceans. Two U.S. senators are working on a proposal to do just that, and one of them is Maine Republican Olympia Snowe. Working with Sen. Sheldon Whitehouse, D-R.I., Snowe is hoping to co-sponsor a bill, the language of which is still being crafted, that would create a National Endowment for the Oceans. In a prepared statement, Snowe said Tuesday that much of her work in the Senate has been aimed at enhancing protections and management of the country’s coastal and ocean resources. “The legislation Sen. Whitehouse and I are developing would be a major step forward, ensuring a steady stream of funding for state, regional and national ocean and coastal priorities,” Snowe said in the statement. According to Snowe, the endowment would be funded in part from offshore oil and gas mining operations, such as the BP drilling effort in the Gulf of Mexico that erupted in disaster when the oil platform Deepwater Horizon exploded and sank on April 20. Interest generated by an oil spill liability trust fund also would go to-ward the endowment. 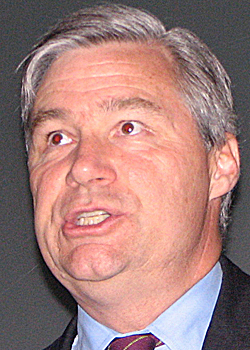 Sen. Whitehouse, in publicizing the concept last week at the University of Rhode Island Graduate School of Oceanography, said that global climate change is affecting the chemical makeup of the oceans. The oceans’ ability to absorb carbon emitted by human activities is reaching its limit, Whitehouse said. As a result, he added, ocean acidification levels are the highest they have been in “8,000 centuries,” which threatens some shellfish species with not being able to form the shells that keep them alive. “Our oceans simply cannot take it anymore,” Whitehouse said. Don Perkins, president of Gulf of Maine Research Institute in Portland, said Monday that even for people who do not believe that humans are causing global climate change, the time for a permanent, government-funded endowment for ocean research has arrived. Already, the federal government helps provide funding for scientific marine research through programs of the National Science Foundation, National Oceanic and Atmospheric Administration, the Office of Naval Research, and other such agencies, Perkins said, but not all of such research is geared toward ocean ecology. A Na-tional Endowment for the Oceans most likely would significantly boost the amount of funding available for learning how to protect the health of the marine environment, he said. The reduction of data buoys in the Gulf of Maine Ocean Observing System in recent years because of lower federal funding levels is a good example of the country’s need for more marine research, he said. Research into the movement of species between the Gulf of Maine and Georges Bank, lobster reproductivity, and “a million questions” about groundfish all could benefit from the creation of such an endowment, Lapointe said. Scientific unknowns about populations of Atlantic herring, which is the bait of choice for Maine’s $220 million lobster industry, have led to controversial reductions in the overall federal quota for the fishery and in the recent closure of the Stinson sardine cannery in Gouldsboro, which was the last remaining sardine cannery in the United States. “It makes a world of sense to me,” Lapointe said of the endowment idea. Rob Snyder, vice president of programs for the Rockland-based Island Institute, said Tuesday that not only is more marine research needed, but there needs to be better communication about such research with the coastal communities that depend on marine activities for their livelihoods. “We see a tremendous need for stronger ocean science and science translation,” Snyder said. According to Perkins, the oil spill in the Gulf of Mexico is fueling talk of such an endowment, but the need to learn more about the oceans goes beyond oil spills. Research is needed just to map out how oceans work, he said. What marine habitats are critical? What is the effect of pharmaceuticals in lakes, rivers and oceans? Which marine species might be more important to the overall ecosystem than others? These all are questions that should be looked into, he said. “There’s an infinite array of issues to tackle,” Perkins said. Perkins said that how the endowment would be organized and whether it would become politicized, the way the National Endowment for the Arts has been, are other concerns that could effect how effective it may be. But he said just the establishment of the endowment is a step in the right direction.